In a stunning example of efficiency, we managed to get the entire league to vote on this round of proposed amendments within just 48 hours. Needless to say, this is a brand-new record for SLB voting. Praise be to the SurveyMonkey gods! In keeping with tradition, any amendment that ended with a deadlocked vote will be considered defeated. We are very much a democracy in the Salmon League and if the majority does not want something, the tie goes to the runner and we leave things the way they are for the time being. Should the Salmon League institute a moratorium on additional amendments to the league rules for the next three seasons? What this Means: In the case of a tie, a majority does not approve the change and the moratorium proposal will not be activated. Amendment proposals will be accepted throughout the 2014 season and voted upon at next year’s Winter Meetings in preparation for the 2015 season. Should one “NA” roster spot be added to each team? This additional spot would allow teams to hold onto a player in the minors and/or a suspended player without wasting an active roster spot. It would operate in the same fashion as the DL spots currently do, but the player would not be keeper-eligible. What this Means: Beginning in 2014 each team will have one “NA” roster spot for inactive (but non-DL’d), minor league, or suspended players. Team are not required to put a player in this roster spot and the player listed in the NA roster spot will not be eligible as a keeper at season’s end. Should the move limit be abolished for 2014 and beyond? What this Means: Beginning in 2014, the SLB will operate without a move limit to accommodate the growth in roster size and league size since the move limit was established nearly a decade ago. So there you have it. We’ve got two changes coming to the league in 2014 including no moves limit and an additional inactive roster spot. Obviously, this league is always evolving and given all of the talk about people using these rules to their advantage and finding loopholes to game the system, it’s entirely possible we’ll be voting on related amendments next offseason. For now, I want to say thank you to everyone for voting and for the lively debate throughout the year. I’ll reset the Amendments Page on the SLBlog in early 2014 as we open up the floor for new amendment proposals. I feel like we say this every year, but the 2013 season was another intense battle to the finish. This has really become an indictment of this league as we have many teams that know how to put together a winning club to compete each year. 2013 saw four teams battle it out for 1st place during the regular season from start to finish. It saw High Cheese battle from an incredible deficit to make the playoffs. It even saw the emergence of 38 MPH Heaters, InSaNeAuDiO implant himself as a consistent competitor, Radioactive Rush fall on some tough times (seriously, look at the numbers), and Genies in a Bottle miss the playoffs for the first time. The Dominators’ owner has done his share of gloating over his first championship since the 2006 season. Many in the league hate this because he is the first team with 3 championships in league history; and he’s also one of the biggest loud mouths in the league. Even using arguments from years past to support undefined ways that make him sound better than he actually is. Most likely, we’re all about to hear him be as raucous as humanly possible until one of his league mates can match him in titles. Personally, it was one of the most challenging years I’d ever experienced (aside from the years I don’t make the playoffs). Every day was a grind it out moment that saw me spending way too much time idly watching the ticker too late into the evening (my best player is on the west coast). However, now with the regular season two months past and the Winter Meetings in Dallas quickly approaching, like the real-life players of this game we love, it’s time for us to look beyond what was and look to what will be – The 15th season of the SLB; 2014. While it’s still really difficult to make the assumptions I’m about to make – the regular baseball season is still four months away and we have untold numbers of real-life free agent signings, trades, injuries, and happenstances (we don’t even know if A.J. Burnett plans to retire yet or not); plus, our own fantasy difficulties to take into account based on the fact that we haven’t had the SLBs Winter Meetings, Draft, or keepers – I’m going to attempt to put together a list of who has the best chance to win the 2014 SLB Championship by ranking each team’s chances on a basis of A-F.
I’ve also spent quite a bit of time over the years creating a way to evaluate each of our teams over the long haul. Taking into consideration what each team has been able to accomplish over their careers, in my opinion, would be the best way to get a good idea of what to expect from someone going into the next year. Cracker jack has only missed the playoffs once since they were instituted in 2005 & their team is a great sample to use for someone that you would anticipate to make the playoffs every year. But there’s more to the story, cracker jack has also not won the championship since 2005. In fact, he hasn’t even made it there. As a result, he may be someone an evaluator would shy away from to win the Championship based on the likelihood that cracker jack would crack in the big game. However, the biggest difficulty in evaluating at this current moment is that some of our teams have 14 years of experience and some of our teams (High Cheese, 38 MPH Heaters, Dome Dog, & Radioactive Rush) don’t yet have five years of history to their name yet. Currently, I feel like five years is the best sample size to be able to evaluate a team based on the things they’ve been able to accomplish. For example, both ZIMA & SeaBass had quite a bit of success in the early portion of their careers. ZIMA made the playoffs his rookie year and finished 3rd. ZIMA hasn’t been able to replicate that type of success since. Even with top-notch keepers at his disposal every single year. SeaBass finished 4th in the regular season his rookie & sophomore seasons; even finishing 2nd his sophomore year. However, they haven’t made the playoffs since – a streak that continued for its 6th year in 2013. I believe that five years’ worth of data would offer the best axiom for evaluation because of situations like the one that currently resides with Dome Dog. Dome Dog stepped up to the SLB plate ready to hit his rookie year and put on a Pujols-ian show by winning the league title. He then made the playoffs in 2011 (2nd year) & 2013 (4th year), but in 2012 he laid the largest egg possible by going home with a 13th place finish, missing even the consolation playoffs. So, Dome Dog’s 5th year really appears to be his defining year to determine what and who he is in the SLB. Everything points to him being a contender every year, but, depending on their 2014 finish, perhaps they could be labeled as a Jekyll & Hyde team if they finish with another non-consolation finish. Like it or not, how you’ve performed in the past will affect the odds of your future success. Let’s be honest, the Blue Jays were the odds-on favorites to win the World Series at the beginning of 2013. Then Reyes got hurt. Buehrle pitched like the old Buehrle he is. Dickey sucked. Bautista got hurt & the chances of the entire organization went down the tubes with them. Anybody think the Blue Jays are going to be the odds-on favorites in 2014? Since we don’t have five years’ worth of data available to us for each team, however, I’ve decided to utilize an analysis that covers three years (the least amount of league membership). Below, you can see where your team has finished since 2011 & the overall average finish for each team’s regular season & post-season. With all of this established, let’s take a swing and miss at predicting which team has the best chance of taking home our 2014 championship. Below you will find a list of the SLB teams with a Grade based on that team’s perceived chance to win the 2014 Championship, some made up Odds coinciding with that team’s grade, and the Reasoning why that team is listed where they are. Reasoning: As mentioned previously, SeaBass had quite the start to his career. Not only did he finish 4th in ’06, but he did so again in ’07 and he took that ’07 team all the way to the Championship where he blew a 2nd week lead to money grubbers. Granted, the league had 8 members in ’06 & 10 members in ’07, but SeaBass still showed an early propensity to make intelligent moves that brought him places. If nothing else, he was at least middle-of-the-pack enough to have a chance to do something once the playoffs hit. That was 6 years ago. Since, team SeaBass has put up the following winning percentages: .472, .491, .471, .422, .493, & .429. Only twice has SeaBass put up a year that could even be deemed competive-ish, let alone worthwhile. Earnestly, I believe the breakdown came when he traded Wright to Genies. Since, the most moves that have been made by SeaBass was 30 in 2011. In fact, there have been three years where less than 20 moves were made by this GM since this trade occurred in 2008. Is there a chance that we have a shy trigger? Good trades being missed? Logical free agent acquisitions tentatively viewed? We all know that we don’t win this league at the draft, which is really too bad because SeaBass has some world-class keepers in CarGo, Encarnacion, & Scherzer; plus a projected draft pick of Jean Segura really can add the speed & OBP that could keep this team elite, but without the willingness to dig deep into the free agency well to take some chances, we just can’t sign off on a higher chance of a Championship. It’s really too bad, because SeaBass GM’s shark-like tendencies could be really fun if they were seen at full strength. Reasoning: SL Disappointment has done his best over the years to live up to his namesake. Since winning the very first league Championship back in 2000, SL Disappointment’s GM has battled with disinterest, leaving the league, and inactivity. Since coming back in 2010, the SLB has seen a more dedicated GM with the tools to do what is necessary, but without the talent to do what is needed. He hasn’t been able to find the 2nd keeper that sets his team apart, so SL Disappointment typically starts the year in a hole. He’s ridden Bautista about as far as Bautista’s talents are going to take him, Lee is getting old, and Pence (his 3rd best player that I’ve projected he’ll keep) is talented but isn’t really a difference maker. Fortunately, the Disappointment’s luck may be turning. With a deep & talented 1st round appearing to be at the league’s disposal, the Disappointments have a chance to have a true difference maker playing next to Bautista’s talents. We’ll see what he does with it, but I currently have Ellsbury’s 40+ steals playing next to Bautista’s 35+ homers. The Disappointments have proven they can compete when they finished with a .508 winning % in 2011, but were beat out for the playoffs by a mere win. Overall, this could be another case of a manager who needs to have a happier trigger in free agency. Not destructively so & I recognize there’s always a balance, but at least enough to grab one of the hot free agents before they’re all gone. Reasoning: ZIMA is an anomaly. Here’s a manager with the best collection of keeper talent in ages. He inherits Pujols from the team’s previous owner. Lands Kershaw for next to nothing & swindles a trade for Fielder that makes the other owner look like a fool. We all know he has baseball chops and we all know he’s active in trying to put the best team on his make-believe roster as possible. However, even with all of this going for him, ZIMA has a CAREER winning % of .479. It’s enough to make your jaw drop. Even with all of his statistical advantages, ZIMA has not been able to put together a season where he drafts and coordinates his roster into a winning team since his first year in ’09 – back when the league was a 10 team entity. Personally, I’d review a different draft strategy. Something, anything, has to be better than what’s currently being put down on paper. We all know you’ve got the stuff kid. You’re involved in trades. You text other members almost every week about this player or that, something’s got to give. However, for the time being, without any known proof that this is possible & with a declining Fielder & aging Cano as the likely keepers, the odds are not ever in your favor. Reasoning: Don’t get the grade & the odds wrong, j’s team’s GM is a talented fantasy owner. He is tied with cracker jack & money grubbers with two championships a piece. Since the playoffs began in ’05, he’s made them 6 of a possible 9 times. His 14 year career winning % is .497, which is just enough to tell us that he sits right around .500 almost all of the time, which is just enough to tell us that they’re always in it. The reason j’s team is getting such a poor grade has a lot less to do with the talent’s the GM has or the success this team has had over the long run or the keepers he has, which between Longoria, Braun, & Greinke are all successful major leaguers with years ahead of them, but with past injuries. The reason j’s ream is getting such a poor grade is simply that I don’t think 2014 is his year. Personally, I think j’s team needs to regroup and re-evaluate. Since moving to a 14-team league, j’s team has finished the regular season in 11th, 5th, & 12th. He made his way to the championship in 2012 with a team I was shocked could make it there, but, overall, I just think he needs a new strategy for this many league members. So, right now, he sits with a poor grade. Reasoning: InSaNeAuDiO, who, in this post I’ll refer to as IA because the name is annoying to spell, has seen somewhat of a Renaissance under their current GM. A team thought lost for dead, who in 2012 joined many in their willingness to screw up their 1st round picks, finished that year 6th and in the playoffs just to spite everyone. It’s not as though IA has had much fantasy success. He has a career .477 winning %. He’s made the playoffs 3 times since 2005, which is approximately 33% of the time. However, what he has is Miguel Cabrera. He has Miguel Cabrera and a possible draft pick that’s good enough to replace his existing keeper SP with one that might actually be worth his time. Plus, if the aging CC Sabathia can put together a mediocre season, IA might be in business. When you have virtually the best fantasy hitter of all time two years running, there’s a good chance that you’ll find a way to make the playoffs. InSaNeAuDiO may just need to play his hand just right to have a better chance than some of his other league members. Reasoning: 38 MPH Heaters is the picture in the encyclopedia next to the “what have you done for me lately” phrase. If he wouldn’t have put together a good year in 2013, there’s a near 100% certainty that he’s at the end of this list with a big ‘ole grade of F. Turns out though, that 38 MPH Heaters showed a propensity to adapt. He made shrewd decisions. He drafted Jurickson Profar (bad choice) & Wil Myers (good choice) and held onto them…for TWO MONTHS…without them ever playing a single game. He traded for Hisashi Iwakuma and made what could have been the largest blockbuster for the 2nd year in a row later in the year when he landed Pujols & Mauer. The GM of money grubbers and I had a 20 minute argument on whether or not 38 MPH Heaters’ moves this year were good or bad and I lost the argument. 38 MPH Heaters did everything he needed to in 2013 to set himself up for a chance to be successful. His biggest problem? He blew it. However, if things hold, in this league, we have a guy who is currently being a shrewd owner and may be on the rise. We may know more when 38 MPH Heaters reaches their 5 year mark at the end of 2014. Reasoning: Genies in a Bottle is, unquestionably, to this point, the most successful GM the SLB has ever seen. He is the smartest GM in our league. In fact, even if team Dominators, with three pennants won (no other team has more than one pennant), wins the regular season the next three years, they will only be able to tie the Genies’ mark of 6. It’s an outrageous bout of success we may never see again. However, team Genies has a problem. Team Genies is distracted. He works – a lot. He’s getting married. He has a social life that takes him away on important weekends. This grade is not an indictment on anything but the fact that team Genies may have a difficult time winning anything with so much going on. With so many other teams closing the gap even as slightly as they are, team Genies will likely continue, in my view, to hold onto one Championship trophy – hey, at least he recently has one. Reasoning: Something funny happened last year. Team Radioactive Rush was actually good. I don’t mean he made the playoffs. I don’t mean he even had all that successful of a record – he competed, but Radioactive Rush never REALLY had a shot at the playoffs. 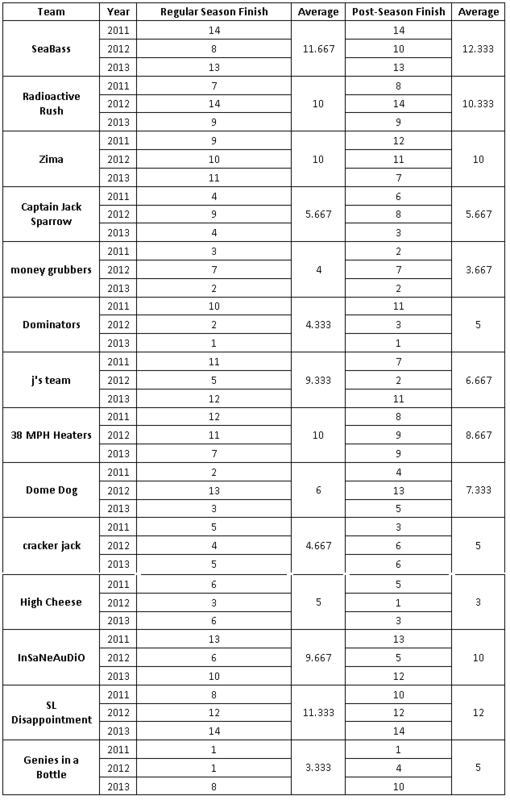 The weird part is, Radioactive Rush had only 9 losses last year; Cracker Jack, our 6th seed, had 11 losses. Per his own stats, Radioactive Rush continued to deem that he was “unlucky,” which I think we all agree is a pretty poor way at looking at anything. Your team either did what it needed to do or it didn’t, but it is kind of funny that the numbers suggest he was “unlucky” and he had fewer losses than one of our playoff members, which means when he lost, he got blown out. This, however, is the type of sign that makes me think that, perhaps, just perhaps, Radioactive Rush is starting to get the learning curve. He finished 7th in the regular season his first two years in the league. He finished the regular season his 4th year in 9th, but close enough to be dangerous-ish come the last week of the season. Reasoning: The Dominators won the 2013 Championship to capture their 3rd and most heralded Championship to date. It’s their first one since 2006, but their second appearance in the Championship game since 2010. Overall, we’re not necessarily talking about the most successful fantasy team here – despite their ridiculous number of Championships. However, what we are talking about here is a team with a career winning % of .509 over 14 seasons. We’re talking about a team who has a .586, .565, .456, & .617 (the highest ever) winning % over his last four seasons. Really, what we’re talking about here with this B- rating is a team that may have figured it out. The most difficult thing team Dominators has to contend with right now is the terrible draft spot he’s about to get and the fact that only one team has ever been a back-to-back Champion – the ’04 & ’05 cracker jacks. While this is a team on the rise, history is definitely not on team Dominator’s side. Thus, a B- ranking is in the cards. Reasoning: Captain Jack is ballsy. Last year he drafted the most promising, injured, injured, & injured team I’d ever seen coming out of a draft. Again, promising, but, again, injured. He turned that into a successful 4th place finish. Captain Jack is good at fantasy baseball. They’ve been a part of the SLB for 6 years now and have missed the playoffs once. Captain Jack’s average regular season finish is 3.833. His average playoff finish is 4.333. He wins. He makes the playoffs. He even wins a championship when he can – Captain Jack holds one SLB Championship. Once, Captain Jack forced the draft table to wait 10 minutes for him to select a player. When pushed why, he said he was looking for a 1B with steals – it was the late rounds. There aren’t 1B with SB in the late rounds. Captain Jack might have a problem one of these years with fielding a successful team. Captain Jack is really good at fantasy baseball, but cannot get a grade higher than a B-, because I’d be too afraid to do so. Reasoning: Personally, I’m not 100% convinced that Dome Dog actually deserves this grade. He goes wildly young at the draft table & a recent criticism of the Dome Dog GM’s strategy is that “[Dome Dog] drafts who [Dome Dog] likes.” In essence, Dome Dog’s GM drafts not draft based on ADP or stats or any statistically measured thing. Dome Dog drafts who his favorites are. So far, it’s helped him to the tune of a four year winning % of .538 and a SLB trophy on his mantle. The deal is, it’s scary to give 18 : 1 odds to anyone who drafts who they like. Sometimes, that gets you 13th place. For anyone who takes this bet, I say good luck to you. But then again, Dome Dog will likely be holding a 2nd SLB Championship by the end of 2014 once you doubt him. Reasoning: High Cheese did something so miraculous it needs to be rewarded. After 6 weeks of a 22 week season, he was buried. Dead last. So far behind I was already calling the morgue. Then he did something amazing. In the next 16 weeks he hardly lost. In the second half, he rattled off a winning % over .600. His team came back from the dead and surpassed the, surprise team themselves, 38 MPH Heaters. His rating here may also come from the fact that in 3 years, High Cheese’s GM hasn’t yet missed the playoffs. He’s built a team to a 3 year winning % of .532. He’s got a good chance to pull away with a top 5 SP in the draft in David Price, who by all accounts, looks like he’s about to get traded either this offseason or at the trading deadline. High Cheese has all the talent in the world to win his 2nd Championship and this B+ rating is completely warranted. Reasoning: Money grubbers has been fighting what appeared to be a never-ending problem. Except for total Championships, he was always in Genies in a Bottle’s shadow. He’s been working to build out of that for years and Genies may have finally thrown him a bone by missing the playoffs. Not only does money grubbers have a 14 year winning % of .524, he’s also only missed the playoffs once in 9 years – that’s a ridiculous 8 playoff appearances. Not only that, but money grubber’s last Championship in 2007 came on the heels of The Dominators’ Championship in 2006. It’s not a stretch to think it can happen again. Money grubber’s GM has built himself a fine set of keepers. He’s done everything he needs to be billed where he’s at in these odds to earn the A- grade. In fact, perhaps the only team that might keep him from jumping Jeremiah for best-run franchise sometime in the future might be the team that’s next in line, cracker jack. We will see, but money grubbers, with 4 championship appearances in the last 8 years and only 1 championship, is certainly hurting for one. Reasoning: Cracker jack is amazing. Since 2005 he has built only one team that missed the playoffs – that was 2007. Even more remarkably, he’s done it by adjusting how he wants to play this game. He’s also done it by always being, relatively, mediocre. As mentioned, cracker jack’s GM has made the playoffs 8 out of 9 years, but his career winning % of .506 is below even the Dominator’s winning %. I fear this may be the year that finally changes. With, as mentioned, an outrageous amount of talent sitting in the 1st round, this appears likely to be the year that cracker jack finally comes through with his big 3rd Championship. With a ridiculous first round and cracker jack’s propensity to make the right moves during the season, he’s already on track for something big. Cracker jack, like money grubbers, also has history on his side, cracker jack’s first championship, in 2004, came immediately after The Dominator’s 2003 championship. So money grubbers holds no wins with karma in this case. Will this be the way 2014 plays out, we’ll see if cracker jack holds that magic trophy or not. Overall, every team in the SLB has something to offer. Every team has had a bought of success and its amazing how each year plays itself through its own progression. I’m excited to call myself a league member with each one of these guys as I truly do believe that the most challenging thing I’m presented with each year may be this league – a ridiculous amount of my time is wrapped up in it & I couldn’t be happier about it. Remember, the above aren’t final rankings, they aren’t who the best team is or who the best team will be. This is only an idea built on an idea about which team, going into the 2014 year, appears to have the best chance of winning an SLB Championship. Our 15th year is going to be a fun year! Good luck!